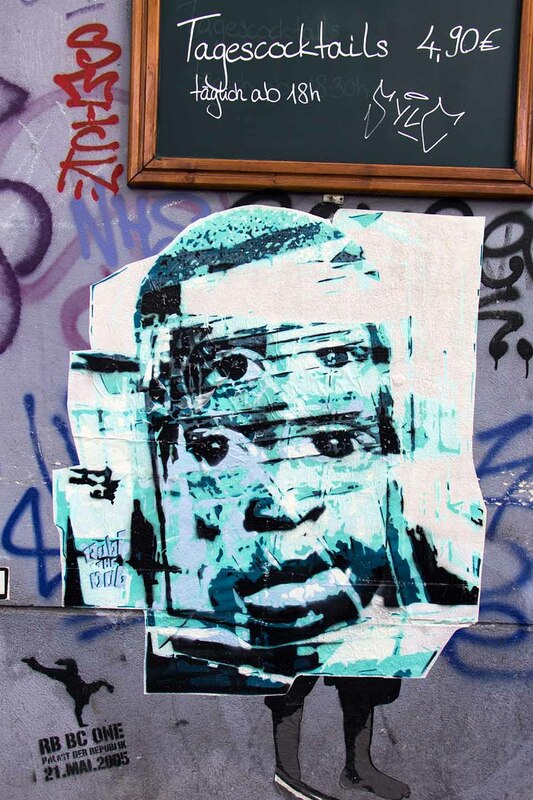 The first time the Swiss Street Artist Robi the Dog visited Berlin, he was so active that you had to be blind not to realise that new paste-ups were popping up all over the city (we’ve already written a post about him and his first visit to Berlin). Now Robi the Dog has visited Berlin for a second time and, of course, he wasn’t here just to see the Brandenburg Gate. 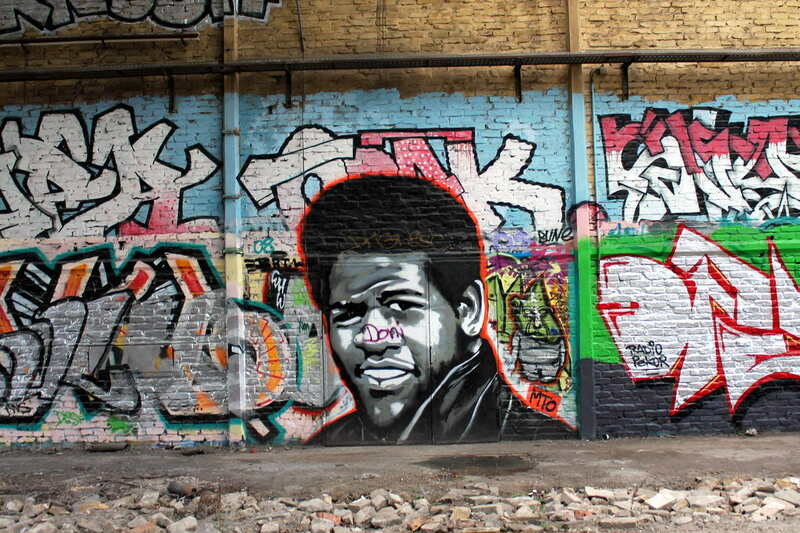 Once again he was pretty active in the streets and left a lasting impression on the walls of Berlin. This time, however, we wanted to catch up with him, do an interview, take a look at his way of working and show him some of the coolest places in the city (which wasn’t easy as it became clear that, despite it only being his second visit to Berlin, he knew the whole city already). Robi, since when are you doing art? Before I started doing Streetart I was a Graffiti Writer for over 10 years. I started doing doodles and sketches in my books at school when I was 13 or so, but it didn’t take long before I was doing my first tags, then my first pieces, then I got arrested and stopped writing, and then eventually I started writing again. But then I got an Akai MPC, and I started creating my own music under the name „The Dusty Button“, mainly instrumental beats that can be found on Soundcloud. 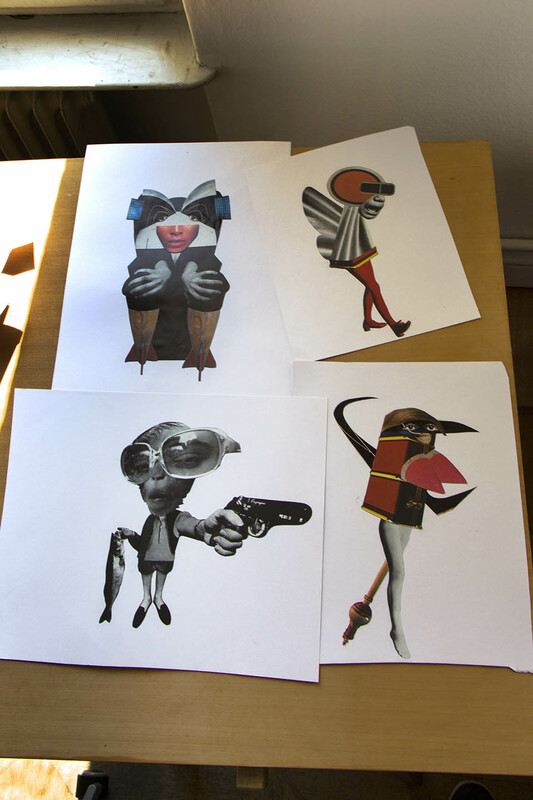 It was only in 2006 that I started working as a visual artist again. From there it didn’t take long before I was getting involved with Street Art. 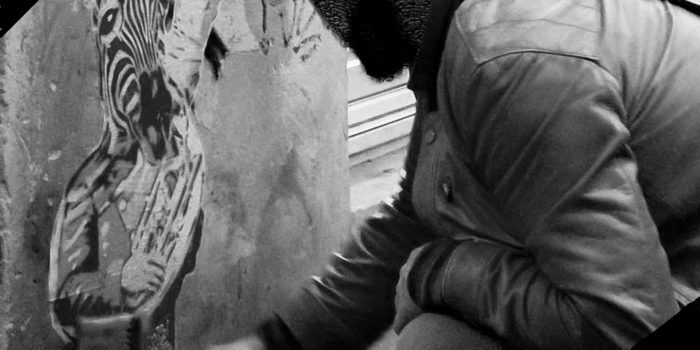 Why did you decide to display your art on the streets instead of working like a ‘normal’ artist? For me it’s not about fighting against the advertising industry and the media. By doing Street Art, and not playing by the rules of the authorities, I have the opportunity to reach a large number of people directly. And I don’t think what I’m doing is wrong, I am just taking what belongs to me, I’m exercising the right to change the environment I’m living in, in the way I want, the same way people choose not to litter in the streets, or the way youngsters get together and set up a halfpipe in their neighbourhood; the only different is that I take my right instead of asking for permission. I just do it. Another thing is that I don’t really like to work, which doesn’t mean I simply do nothing all day or am really lazy; I love to go hiking in Switzerland or travelling and stuff, but I couldn’t be a nine to five zombie, 6 days a week, for the next 20 years. So don’t get me wrong, I put 100% into the artwork I produce but sometimes I have to find other work, usually when I run out of money (Robi laughs). Nevertheless, even when I just have a ‘normal’ job, I also work really hard and always give it my all. 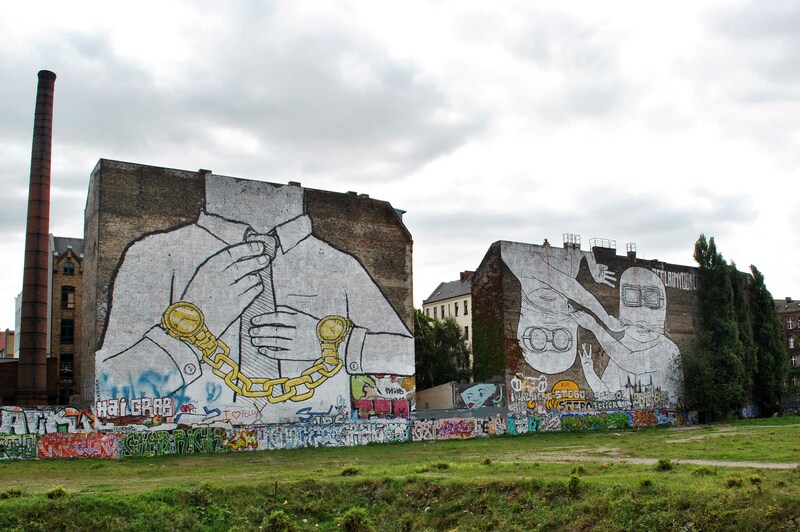 It’s your second stay in Berlin, how have you managed to create so many pieces in so many different locations? 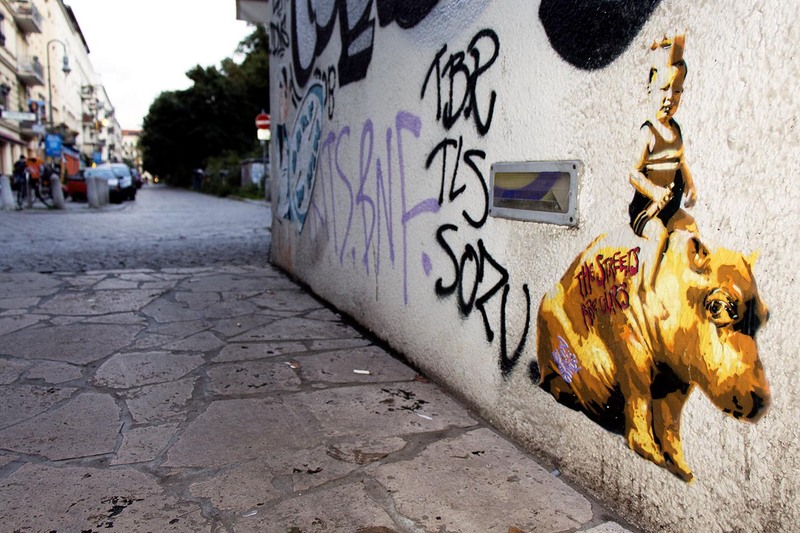 Your works have a substantial presence in the streets and you’ve quickly gained recognition. There are advantages to being a tourist (Robi laughs); I always have my bike and my paste with me. Wherever I go, I always take these two things with me. If you take the bus or train, or even go by car, you won’t see much of the city. But after a week on my bike, I know a city and its districts pretty well, regardless of whether it’s Berlin, Hamburg or New York City. 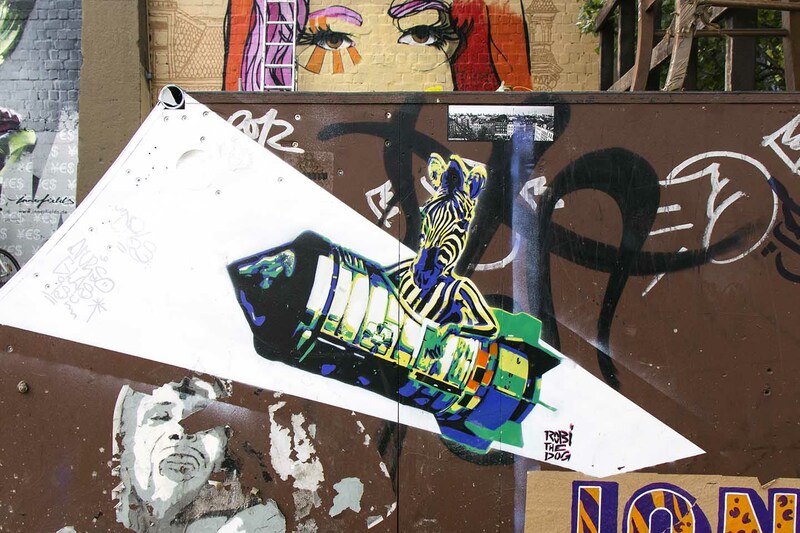 In which citys can we find your art works? 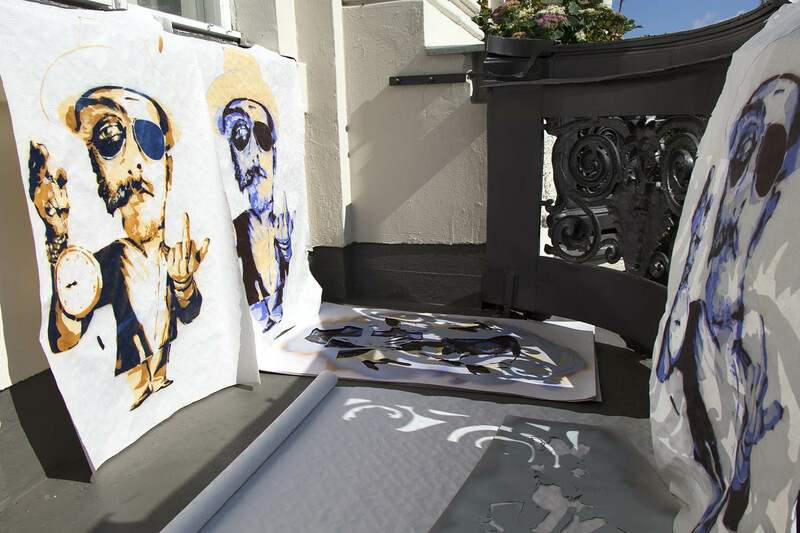 Apart from places in Switzerland I left artworks in: Berlin, Hamburg, Poznan, Warsaw, London and on the Upfest in Bristol. 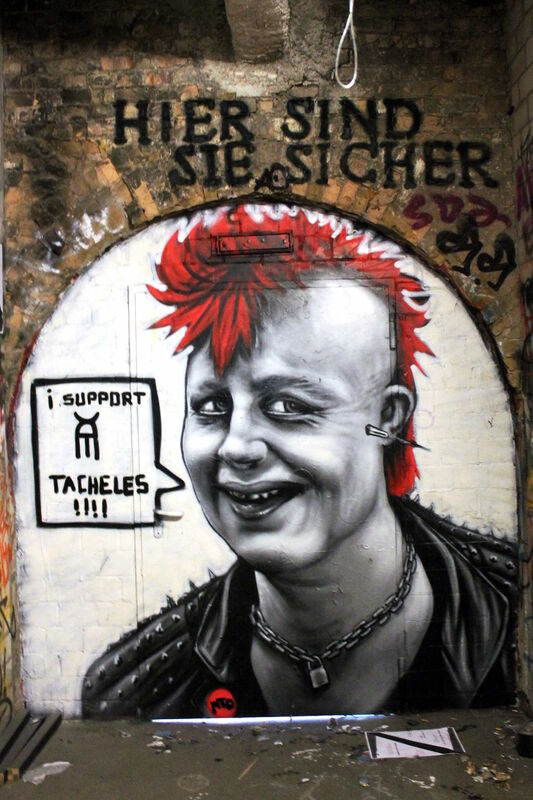 What is the different between the Swiss and the Berlin Streetart scene? You can’t really compare the two. Switzerland is very quiet and in Berlin you have all the noise, colour, waste and dogshit on the streets. This places the art in a completely different context. The Berlin scene is also bigger. 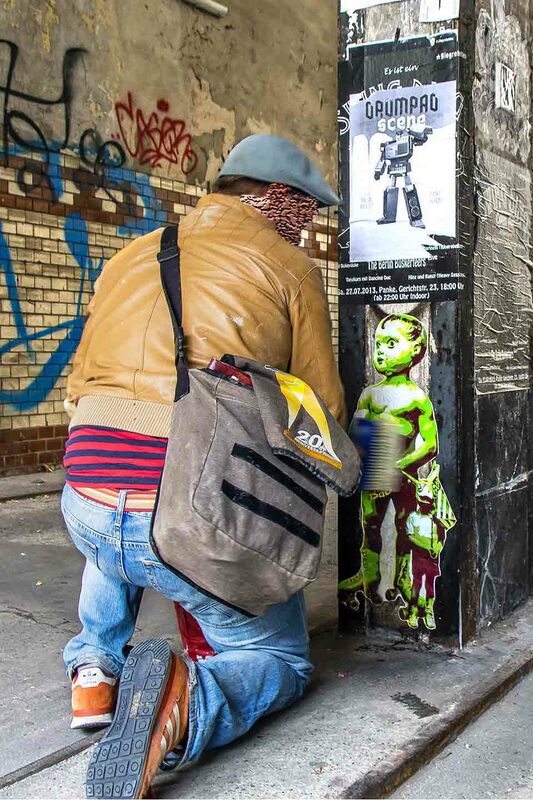 In Berlin you find the street art on the streets, where it belongs. 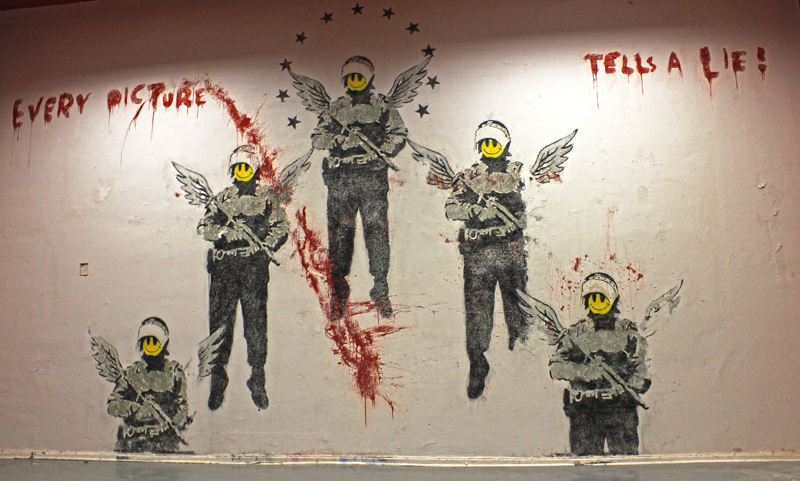 In Switzerland, however, you find more and more street art in the galleries and far less on the streets. Another thing is that everything is getting cleaned up so fast in Switzerland that it’s really demotivating to go out there. Is there anything you are personally proud of? An artwork you’ve created or a project you’ve taken part in? There is no one particular work of art or exhibit I am particularly proud of. 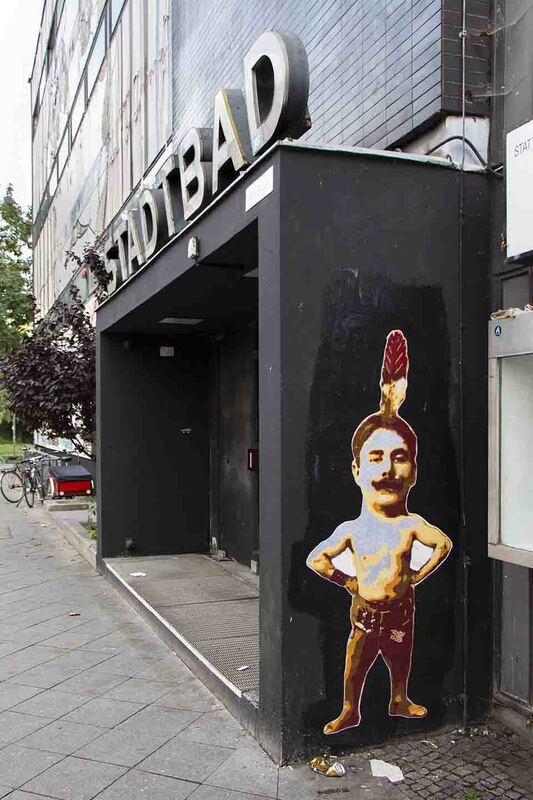 I am just happy when the artwork I left in the streets of Berlin is still there when I come back or when I get positive feedback for what I have done. To me it means that people like and respect my work, which means a lot to me. Most of the feedback I get is positive, but I take all kinds of critism positively, even the negative stuff. 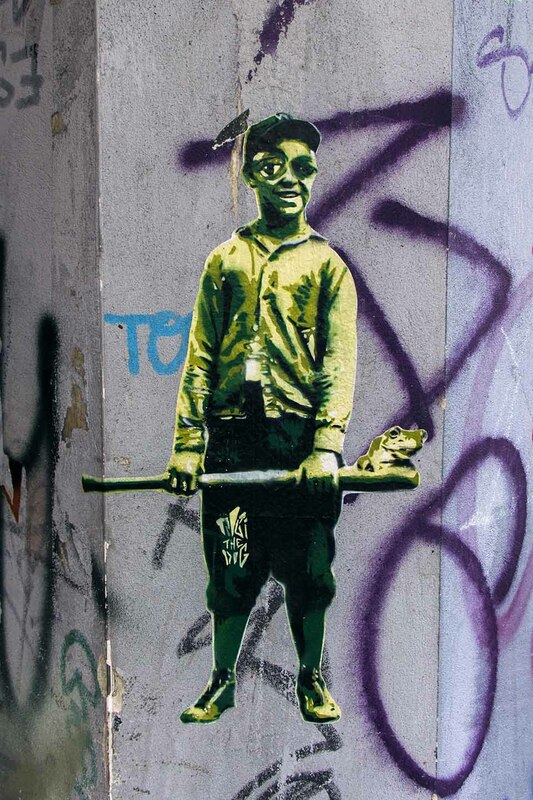 I am a street art tour guide in berlin. While on a tour yesterday around the intimes Kino, I saw a new Robi the Dog paste-up with plastic covering it so it can’t be removed or damaged. Is someone putting up his leftovers or forging new ones? What’s going on?